Considered by many to be the funniest farce ever written, Noises Off reveals the hilarious backstage antics and drama of a group of small-town actors attempting to perform a dreadful flop called Nothing On. This play-within-a-play is a comedic triumph of slamming doors, falling trousers and flying sardines. Written by award-winning English novelist and playwright Michael Frayn (Copenhagen, Democracy), this slapstick comedy of errors remains a crowd pleaser more than 35 years after its debut. 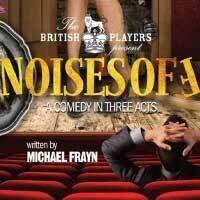 Laugh along as everything goes hilariously wrong in this production of Noises Off at Kensington Town Hall. "...Overall, this show made for an incredibly enjoyable evening of theatre. In our world today, we need a laugh more than ever. I recommend checking out this production, as it will more than fill your laugh quota for the week."